CooLingerie: What Makes a Wedding Dress So Expensive? What Makes a Wedding Dress So Expensive? The most eye-catching part of a wedding dress is the exquisite embellishments of romantic lace and dazzling crystals, which differ bridal gowns from other formal dresses. 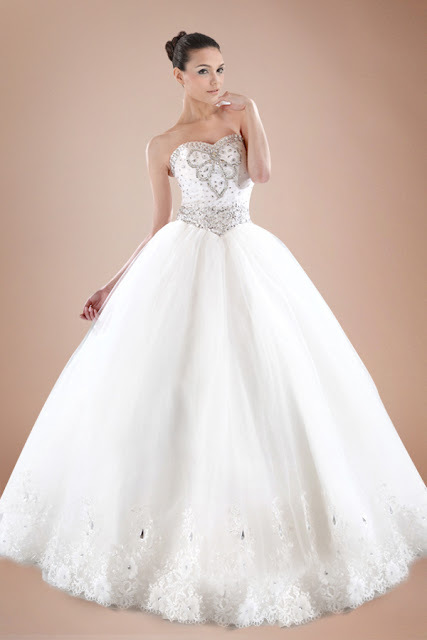 The value of a wedding gown is to a large extent decided by the amount and complexity of decoration on a wedding dress. Then what kind of handicraft are usually used on a wedding dress? Next, I’ll make a simple introduction to you. Numerous tiny beadings are completely strung by hand according to a certain pattern. Before the sewing job, workers draw the pattern on the fabric with air erasable pen fade pen. And when the sewing work is finished, they put the dress into the water so that the pattern could disappear. Beadings are various in shape: beads (round ones), tube beads (angular tube-shaped ones) and sequins (leaflike or round heptahedron). In order to ensure the good visual effects, generally, two or three different kind of beadings could be used even for a simple pattern. 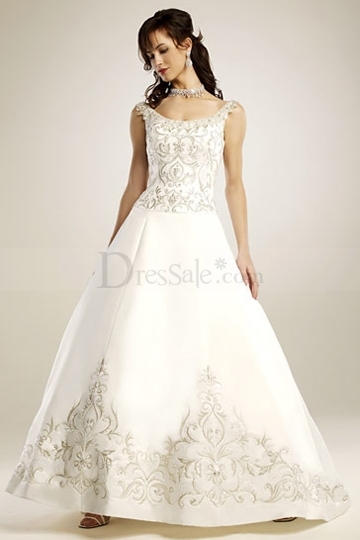 We can commonly see a satin wedding gown embellished with abundant beads, fine and neat. This is a delicately made high quality custom made wedding dress with handcrafted beadings which form numerous refractive surfaces, showing dazzling sparks under the light. What’s more, the exquisite beaded crafts stand the test of observation. What a truly great work of art! This is not an easy job. Here we do not refer to the purely handcrafted embroidery which values a sky-high price. Normally, the embroidery on custom made wedding dress is made by an embroidery machine. The process is also very complicated. First of all, the original embroidery pattern should be drawn accurately. And then the pattern will be composed to the corresponding place of the fabric after being input into computer. Lastly, the embroidery begins. All this whole process requires considerable workload and rich experience. The hem part of this wedding gown is a perfect demonstration of embroidery craft. Floral pattern is impeccably embroidered upon the seams where the two fabric panels meet. This definitely a complex process because the two pieces of fabric should be sewn together flawlessly and then the embroidery could get composed and done. As the name indicates, it is a piece of embroidery with beads sewn up. The thickness of the embroidery together with the convex of the beads attached on the embroidered pattern creates a three-dimensional light & shade effects, especially under fantastic lighting. Coupled with the sheen and brightness of the beads, richer visual effect is achieved. This process needs the most complex handicraft, and of course, the cost is also the most. Lace sewing beads, This is a very common decorative technique in wedding dress making. Tubular beads and sequins in the corded lace will produce a very dreamy effect. If it is only the lace fabric, beads and sequins can be sewn on directly according to the lace pattern. If the lace is attached on satin or other fabrics, then there is a process called ”applique” before sewing beads. Applique is pieces of lace decal ironed down out of soft tulle, and then sewn on the fabric in accordance with the design draft, after which the beads are sewn. Due to the unimaginable complexity of this process, the cost of labor and materials enormously large. Your Bridesmaid Also SHINES, Girls! Are you get bored with the WHITE wedding dress? 10 Unique Wedding Venues to Say "I Do"